FERRY GOOD: A new Geelong to Melbourne ferry will not impact its Bellarine counterpart (pictured) the proprietor has promised. 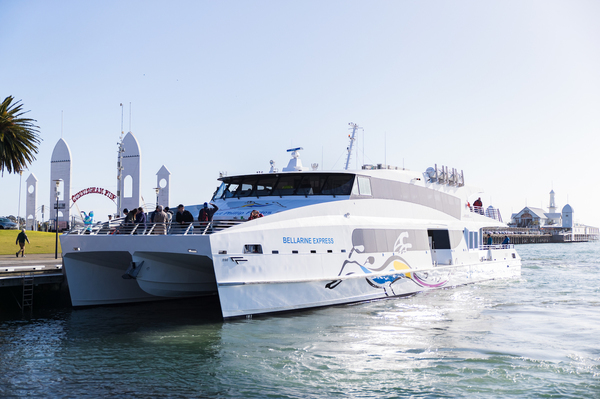 Bellarine Peninsula’s ferry to Melbourne is here to stay despite a regular Geelong service set to launch in December, its proprietor has promised. Port Phillip Ferries chief executive officer Murray Rance “absolutely” guaranteed the Portarlington-based service would continue, in response to concerns for its future. “We are contracted to the government for three years and we have completed half of that contract,“ he said. The company’s Geelong ferry would not divert passengers from the Bellarine service, as they each attracted costumers travelling for different reasons, Mr Rance said. “In fact we think having both services will bring more attention to our business, therefore resulting in increased visitation to both destinations. Port Phillip Ferries would market the alternative destinations to passengers on both services, Mr Rance said. The guarantee comes as Tasmanian-based manufacturer Incat builds a ferry for the Geelong service, set to sail in early December. Bellarine Ferry Group’s Geoff Henderson reported a 120 per cent increase in commuter numbers in a year for the Portarlington ferry. The ferry carried 385 and 370 passengers on two separate Sundays in March, Mr Henderson said.